Argonaut Water: Water Purification Systems. ?ategic Asset Protection Systems, Inc. Independent operations, anyway, for large communities. The Argonaut Super Villager can clean up to 40 US gallons (151.41 liters) a minute / 2,400 US gals. (9,085 liters) an hour / 57,600 US gals. (218,040 liters) a day, eliminating 100% of all bacteriological and viral contaminants, and do it without the need to ever change filters. Additional, replacement filters can be used to address mineral contaminants. Can be powered by solar, battery, or generator (or mains electricity). Click here for more details. Total Independence, Total Water Purity, Anywhere in the World. 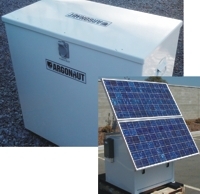 The Argonaut Villager ultra-filtration system can be powered by solar panels, batteries, mains electricity, generators, or even just municipal water pressure. But it can function in the most remote communities, even those without any modern infrastructure. Producing 16 US gallons (60.566 liters) of purified water per minute (that?re than 87,000 liters a day), purified to the most exacting standards possible: 0.01 microns. It can take care of the needs of a community of several thousand, or clean the water for hospitals, office blocks, and more. It can be part of a potable water plus drip-feed irrigation network to dramatically transform lives in remote communities. Best of all: no filter changes ever; the system automatically backwashes. Life-cycle costs (because there are no spares or filters to buy) mean that water costs as little as one-ten-thousandth of a US cent per gallon. Click here for more details. Click to see the Villager details in Arabic, or in Amharic. Check out the YouTube video on the Argonaut Villager, by clicking here. A Back-Packable Solution for Emergency Relief or Expeditions: Absolute Purity, Absolute Portability, with the Back-Packable Argonaut 200. No system in the world purifies water to a better standard than the Argonaut: removing all biological and viral threats, down to 0.01 microns (five times better than the US Army standard). And the Argonaut 200 weighs only eight pounds (3.628 kg), produces two US gallons (7.57 liters) of purified water per minute. No filter changes, ever. No diesel required (it uses a fold-out solar blanket, which can be accompanied by a small battery for night-time use). It is absolutely self-contained, ruggedized, and is maintenance free, apart from being easy to use. And it?onomical, with life-cycle costs (over a 10-year minimum life) of one-thousandth of a US cent per US gallon of water. Click here to see the specifications. Click to see Argonaut 200 details in Arabic, or in Amharic. Check out the YouTube video on the Argonaut 200, by clicking here. Desalination Solutions: Most water solutions call for the elimination of biological hazards, but when desalination of salt water is absolutely necessary, Argonaut also can provide a range of new-technology reverse osmosis (RO) solutions which dramatically enhance options for those situations. The light weight, transportable Argonaut 700, for example, produces 500 gallons per day (gpd) of purified water from any brackish or seawater source. Click here to see the Argonaut 700 specifications. Argonaut filtration is tested and certified to the highest standards in the world. Contact: In the US, Tel. +1 (703) 548-1070. Email: PvG@ArgonautWater.com. Argonaut Water, Inc., PO Box 320483, Alexandria, Virginia 22320, USA.